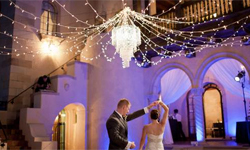 Affairs In The Air specializes in creating magnificent draped lighting effects, arches, and other focal items to make your wedding truly spectacular! Feel free to view our Photo Gallery for samples of our prior projects--keeping in mind that each project is completely customized to suit your needs. At AITA we believe that every bride deserves something truly spectacular for their special day. And it is our top priority to see that you do! What do we offer to accomplish this? 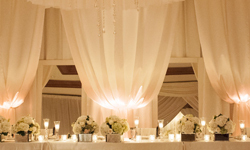 Draping / Lighting: Some rooms have a great view but need a little bit of TLC to make fabulous. Curtains around the room can be used to create a clean but regal look for the perimeter and then draping in the ceiling no matter how large or small of an enhancement can finish it off. Up-lighting can be added in a soft white or in a hue of color to bring the whole thing to life. Crystal & Bling: This accent can be added in many different ways. With small garlands in the windows to large chandeliers hanging in trees or overhead. There is always room for a little "BLING". Outdoor Effects: With overhangs, curtains or just lighting where no one thought it could be hung. Affairs in the Air can add lighting enhancements to any area. 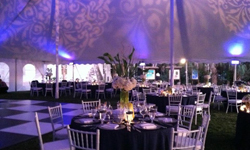 Patterns and colors can add that look to the back of a building to create a focal point for your whole event. 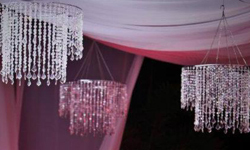 Tent Decor: Draping, lighting, chandeliers or a combination of all can take a white tent and turn it into the ballroom outside. What a grand way to have a party anywhere. 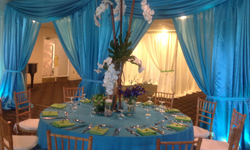 Add Color to your Event: Weddings don't always have to be Ivory or white. Adding in your own style with color is a way to make a statement. It can be done in pieces or as the total room, all done to create a great look for your day.